This is Ike and Tina. I'm pretty sure they're inbred. They raised one batch of fry, which was an epic adventure for me and my roommate. Since then, they still spawned constantly, but they've been careful to eat all the eggs. I guess one round of parenting was enough for them. They survived the Great Tank Leak of '08, lived in a bathtub for two days afterward (and somehow didn't die from the soap scum, which is a minor miracle in itself), and then did a three-week tour of duty in a plastic goldfish bowl while I glued and re-glued the seams of their swanky glass penthouse. Anyway, last month, Tina started swimming in weird loops. Usually that's a sign of a swim bladder problem, so I consulted the experts and tried what I could: shelled peas, epsom salts, antibiotics, you name it. Nothing worked. I figure she's got a tumor of some kind pressing on her swim bladder, or else (more likely) she's full of eggs she can't lay. This weekend, she started crashing out on the bottom of the tank - still getting up to eat (oh my God, does she eat), but then falling back to the bottom, totally knackered. At this point, she's been sick for a month, and she's only getting worse. So I figure it's time. We love our cats and dogs (and horses and ferrets and chinchillas) because they're great little buddies. We play together. We have lovey times. We're friends in the truest sense of the word. That's not really true with fish. To them, I am merely the Great Shadowy Force that causes food to appear in the Holy Purple Floaty Ring. But Ike and Tina didn't need a human person in order to live big, amazing lives. Growing up, parenthood, a bona-fide love-triangle, danger and hardship and adventure on the bathtub seas... and here at the very end of it, Ike poking Tina relentlessly to try to get her to swim again. In a way, it is immensely comforting to know that there are dramas and epic stories unfolding all around us, ones that don't need our attention, much less our intervention, to play out in grand form. And sometimes I think all we really to do is learn how to notice them. --You wanna name all of 'em, right now? All right. We'll name this half Marlin Jr., and then this half Coral Jr. Okay, we're done. You know, usually when people talk about their pet fish, it's not that interesting of a story. Haha, thanks. There's a reason I started GrammatiCats and not GrammatiFish - cuz most of the time, they're probably more interesting for me than anyone else - but every now and again, you find a thesis in unexpected places. I know you know this - you are the Queen of the Deep Thought! 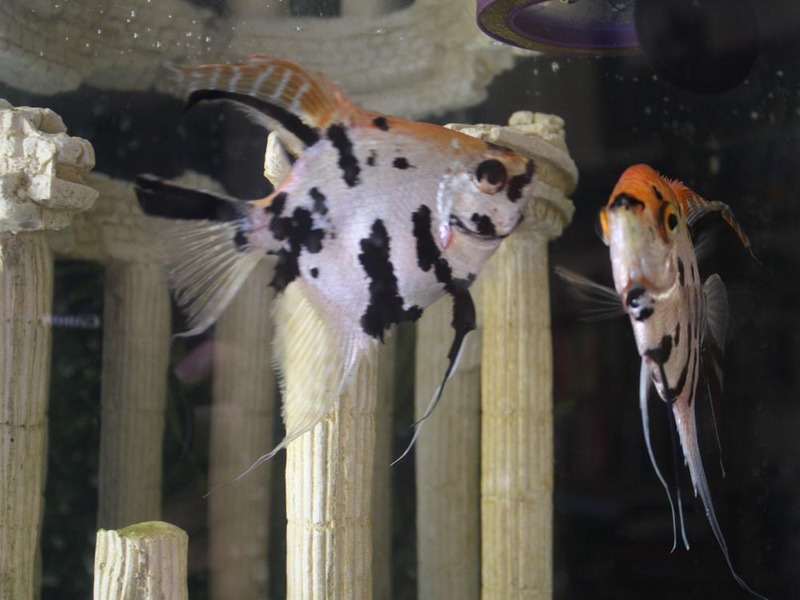 I have a big "Black Moor" goldfish named 'Ozzy' who I've had for a couple of years now. He's had some health problems lately and I've tried a number of ideas from the "experts" at PetSmart and nothing has fully cured him. He's still alive but very lethargic and often just lays in the corner and occasionally swims around. I hope he gets better but I don't know what else I can do for him? Let me know what happens, though - I feel like we've really bonded over fish, here! Sorry about Tina. Great pair-names, though. I had a pair (named by my deep, deep eight year old self)called Halloween and Jack O'Lantern. My parents forgot to feed them while I was at summer camp. Is Ike taking it hard? Hitting the gin? Speaking of which...if this isn't too sensitive, how quickly does that cocktail finish them off? Do you put Tina in her own time-to-say-goodbye-cruel-world martini glass, or what? I hope you're not drinking those too, Tex. Not sure about the nuances of Ike's emotional journey at this point - about all I can say is that he's not too distraught to eat, and he still rules the acropolis with an iron fin. I can't decide whether to get him a new friend next month or just let him enjoy his supreme dominance of the tank. For Tina, what I did was put her in a bucket with some of the tank water, and then mix in some clove oil to anaesthetize her. I gave that about 20 minutes to take effect before I added the vodka, and that did the trick pretty fast. It's sad, but I won't fall off the wagon - I've got to honor her memory! Somehow! Sorry to hear about Tina :-( I've never been a big fish person like some are. Our family (mainly my father) had some periodically when growing up, but I never fancied them. More of a cat/dog person from the get go. Hope Ike took it all well. He was likely a sad panda. Never heard of that method to euthanize a fish before. Fairly interesting. GrammatiCats: Suggest a Topic, Win a Book!